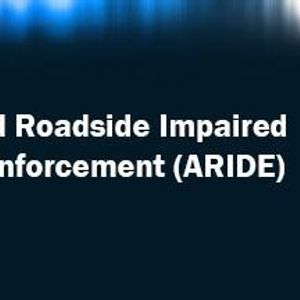 The Advanced Roadside Impaired Driving Enforcement (ARIDE) program was developed by the National Highway Traffic Safety Administration (NHTSA) with input from the International Association of Chiefs of Police (IACP) and the Technical Advisory Panel (TAP). This 16-hour course is intended to bridge the gap between information provided in the Standardized Field Sobriety Testing (SFST) and Drug Recognition Expert (DRE) courses. Students will learn how to observe, identify and articulate the signs of impairment related to various types of drugs or a combination of several drugs. Students will be given an overview of the seven types of drug categories and the physiological effects these drugs have on the human body. In addition, they will learn about medical conditions and other situations that can produce similar signs of impairment. The role of eye examinations in disclosing the possibility of drug impairment and in suggesting the possible category or categories of drugs being used will be discussed. Students must have successfully completed a certified SFST class and be proficient in administering standardized field sobriety test before enrolling in an ARIDE class. Through a working partnership and grant funding from the Arkansas State Police Highway Safety Office, the Criminal Justice Institute will offer these classes at several locations throughout the state.